What do you do when you've checked out all the usual suspects for some cool scatter pillows to update the living room, but can't find anything to fit the vision in your head that is also kind to your wallet? If you are mother-of-two Renata Schmittmann, you scour online and in specialty fabric stores for your dream material. Then you take the plunge and buy material from all over the world in bulk and ship it to your home at the Gold Coast. 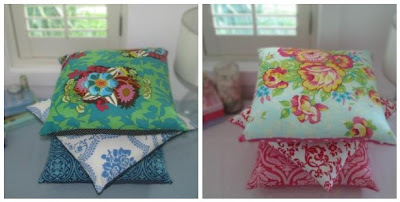 Then you have the perfect pillows made up to adorn your sofa, and launch a fabulous homewares label called Little Home!!! Of course, if you are the like the rest of us, you'll simply thank Renata for her good taste, discerning eye and huge helping of chutzpah, and head over to the Enchanted Closet to pick up some of the Little Home cushions for yourself for $54.95. You'll find them at The Enchanted Closet online store (postage only $4.95), and at the shop in Victoria. You can find the whole Little Home range on the Little Home website. Congrats Renata!